Fantastic for Sunday supper or any other night of the week this Italian inspired dish looks like you put a lot of effort into it but it’s surprisingly simple. Using Greek yogurt locks in the juices, and your pork loin comes out tender and juicy. Panko bread crumbs add a bit of crunch, while Italian seasonings put the flavor over the top. Serve with mashed potatoes, a yummy vegetable and you’ve got a fantastic meal to put on the table. Also comes out beautiful in a rotisserie. Mix parmesan cheese, breadcrumbs, and seasonings in a large shallow dish. Using a spoon coat pork loin in a thick coat of yogurt. 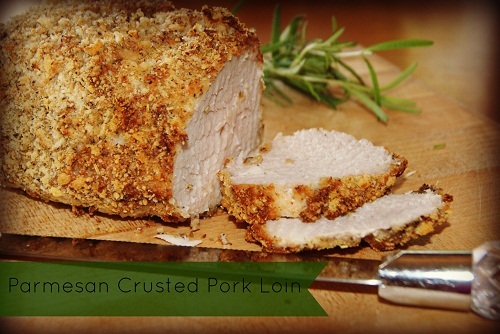 Roll loin in the crumb mixture, coating completely-even the ends. Super full of flavor! Definitely cooks 2-3x longer but really worth it! I was thinking the same thing. I’m guessing it’s actually 20 min per pound,maybe????? does that coincide with how long it took for yours to be done? how was it?